The long anticipated BMW 4-Series Coupe is expected to roll into dealerships this summer, and Bill Jacobs BMW will have them on the showroom floor for viewing by the end of August. Replacing the 3-Series Coupe, the 2014 4-Series will have sleeker styling, sporting a slightly larger, yet lighter body than the 3-Series. The long anticipated BMW 4-Series Coupe is expected to roll into dealerships this summer, and Bill Jacobs BMW will have them on the showroom floor for viewing by the end of August. Replacing the 3-Series Coupe, the 2014 4-Series will have sleeker styling, sporting a slightly larger, yet lighter body than the 3-Series. The design parallels the BMW Concept 4 Series Coupe that debuted at the Detroit auto show in January. Despite the lengthened body and slightly increased width, lightweight materials like aluminum components in the engine allow the new 4-series to weigh between 44 to 99 pounds less than the current 3 Series coupe, depending on the options selected. The new 4-Series Coupe will be a treat for design-driven buyers, as it holds promise of better driving dynamics with a lower center of gravity. A lower suspension setup drops the 4-Series Coupe to under 20 inches from the ground, the lowest center of gravity of any BMW car currently built. Rather than just creating a two-door version of its forerunner, BMW aimed to give the 4-series Coupe style of its own. The unique design for the bumper and lower air inlets help achieve this individualized look. The 4-Series Coupe comes standard with rear-wheel drive and a six-speed manual transmission. All-wheel drive and an eight-speed automatic transmission are optionally available. The 4-Series comes in the 428i form with a 2.0-liter turbocharged four-cylinder or the 435i form with a 3.0-liter turbocharged in-line six-cylinder. A convertible model and possibly a Gran Sport model are expected in the coming years. A new generation of BMW's navigation system, BMW Active Cruise Control with Stop & Go, along with a range of other safety and driving assistant technologies will be offered in the 2014 4-Series Coupe. For additional information, visit Bill Jacobs BMW at 2495 Aurora Avenue, Naperville, IL 60540 or by calling (866) 516-8010. 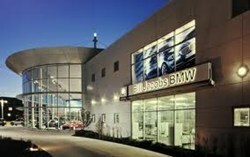 Visit Bill Jacobs BMW online at http://www.billjacobsbmw.com.